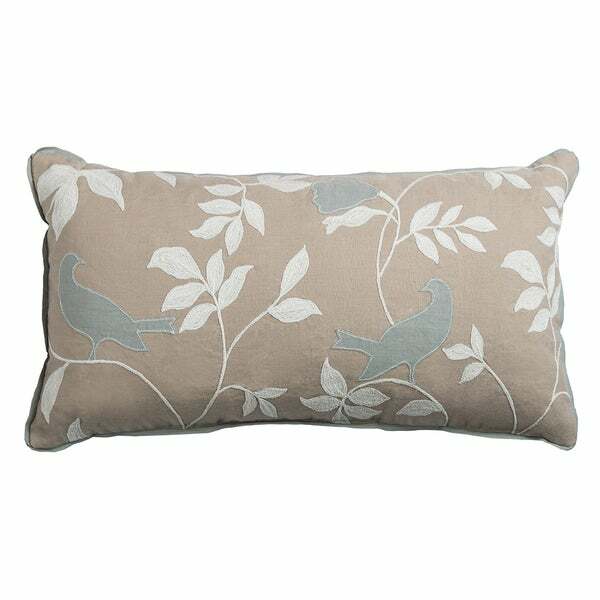 Create a light, mellow atmosphere with the bird-and-leaf designs of this throw pillow. The soft cotton construction of this pillow makes it that much more comfortable to relax on your sofa or bed. Like the pillow a lot. Pretty, firm, nice material. The price for the size is high; the pillow is small. LOVE this pillow! The colors coordinate with my Madison Park quilt set perfectly! I usually don't spend this much for decorative pillows, but this one is worth every penny. I just love the bird accents! The pillow is very well made! This is a nice lumbar pillow. The design is pretty and looks great on my leather couch. Good shape to stand up and quality materials make this a nice pillow. Even though I measured ahead of time and figured the size of these pillows would be perfect, well, they’re not. Plus, the “blue” colored birds are much more grey than they are a blue tone. They’re ok though, I’m just a tad disappointed in them. More rustic than polished. I bought two for my guest room. They offer a relaxed, comfortable addition to the bed. beautiful, well made accent pillow. looks great on my queen bed.